Meagan Bullock MSW, LCSW specializes in working with adults who have anxiety or trauma-related issues. 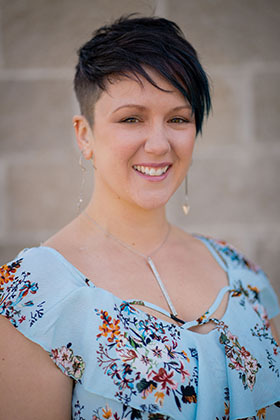 Utilizing therapeutic modalities including EMDR, Cognitive Behavioral Therapy, Solution Focused Therapy, Mindfulness, and Cognitive Processing Therapy, Meagan’s clinical work focuses on the mind, body and spirit connection. Meagan works with clients experiencing a range of challenges including depression, anxiety, post-traumatic stress disorder, mood disorders, childhood and adulthood trauma, life transitions, as well as other co-occurring mental health disorders. Meagan received her Master of Social Work degree from Virginia Commonwealth University where her studies focused on women’s issues and intimate partner violence. She applies the mind-body connection to her therapeutic approach by helping clients recognize how their thoughts and feelings resonate within their bodies and the impact they have on a person’s mental health, behaviors, and over the quality of life. Meagan provides a safe and supportive, therapeutic space where clients feel empowered to achieve their goals and recognize their strengths and personal power. Meagan incorporates art, dance and yoga teachings to assist clients on their own healing journey.